Did Trends Win Last Year's Novices' Handicap Chase? Applying the key Centenary Novices' Handicap Chase trends to last seasons's field created a short-list of four, two going on to take first and second in another cracking Cheltenham betting heat. As the 10-year and 15-year trends show below, this is one of the tightest betting affairs at the Cheltenham Festival, with the winner rarely priced at odds bigger than 12/1 or featuring outside the top six in the betting. The 5/1 favourite A Plus Tard and 6/1 next best Tower Bridge therefore had to make the trends short-list, each having run just three times over fences in novice chases, including over the race distance of 2m4f. They were both second on their last run, and Tower Bridge had previous Cheltenham Festival form, finishing fifth in the 2018 Albert Bartlett Novices' Hurdle. What they lacked in chasing experience, they made up for over hurdles, with plenty of big fields contested. The other two trends picks were 10th Highway One O One, who was second last time out in a chase at Cheltenham that has proven a good trial, and Lough Derg Spirit, who fit the profile, but was beaten by the soft ground and pulled up. A Plus Tard made almost all of the running to give jockey Rachael Blackmore a first Cheltenham Festival victory in the 2019 Centenary Novices' Handicap Chase. 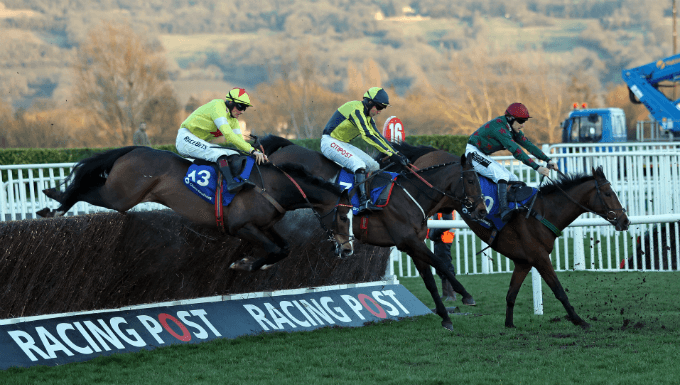 Sent off the 5/1 favourite, the French-bred romped to an emphatic 16-length win, taking the led before the penultimate fence and scampering further and further clear up the Cheltenham hill. Fellow Irish raiders Tower Bridge and Ben Dundee came home next, with the Colin Tizzard-trained The Russian Doyen back in fourth, having led as A Plus Tard made his charge.